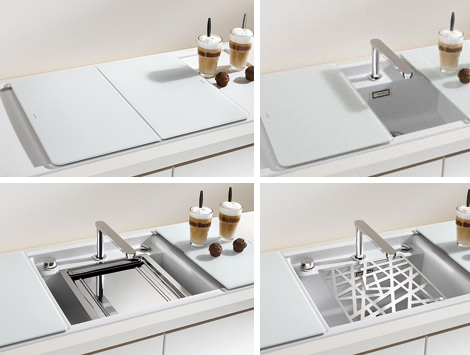 Check out this sink series from Blanco Germany. Actually, these sinks are available all over Europe and the UK and if the stars align, we'll see them in the rest of the world eventually. These ideas are too good for them not to spread. First up is the Blancoalaros sink. boards fit into grooves in the sink rim and can slide along the length of the sink. In the image below, the Blancoalaros sink's been paired with the Blancotelescope retractable faucet. 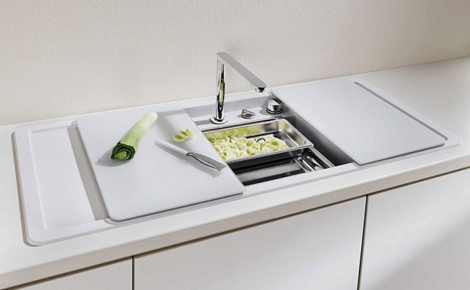 When the faucet's in its down position, the entire space taken up by the sink can be covered with a cutting board. In my tiny kitchen, something like that would be almost three feet of found counter space. In the sink above, the cutting boards are in Silgranit that matches the sink itself. 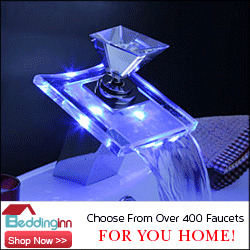 The metal platform and stunning metal strainer are available as accessories. 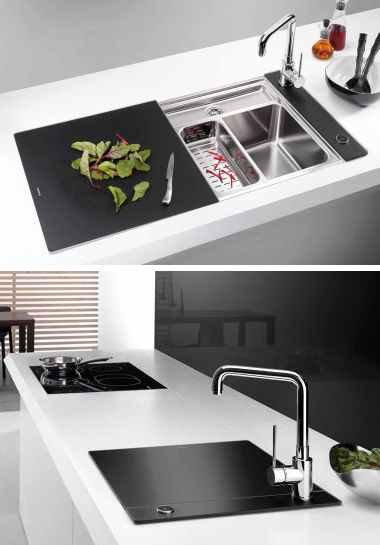 Also sold as accessories for the Blancoalaros sinks are the Crystalline series of black and white cutting boards. In an open, modern space a black sink cover/ cutting board would be the thing that really made the room perfect. It's this kind of thinking that's made Blanco an industry leader on both sides of the Atlantic and as they increase their presence in the US, look for more innovations such as the ones I'm discussing here. I've seen other integrated cutting boards before, but I've never seen them so intelligently designed. Good job Blanco. See the Blanco products available in Europe here and Blanco's North American offerings here. It always bugged me that I have these two big holes in my counter top when I could clearly have more cutting and prep area. I love European kitchens as most of the time, appliances are just the right size and someone thought about the cabinetry as more than a box with a door, especially the low profile stuff that opens up like a Harry Potter tent at a Quiddich World Cup. I love the idea of a faucet that retracts when it's not in use. Talk about clean lines. I love the efficiency of most European kitchens --it's incredible what somebody can fit into a small space. It's even more impressive that for a lot of them, kitchens do double duty as laundry rooms. I have serious sink envy. Wow. I want one. So bad. The microscopic size of my kitchen tortures me to no end when I have need of more than 22 inches of counter. I can only imagine the dream fulfillment that added surface space would provide! If only I could convince the landlord! I have very serious sink envy Rachele. 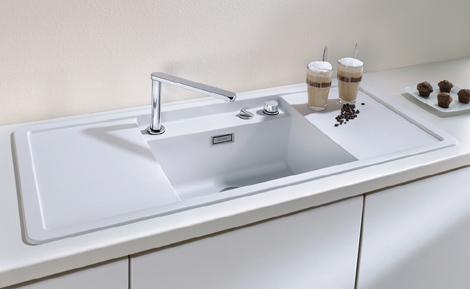 Cham: See if you can convince your landlord to dash of to a plumbing showroom in Berlin to pick up one of these sinks. Now that would be a coup!